Some of Phung Huynh’s fondest childhood memories involve peeling shrimp, chopping meat, washing vegetables and cooking rice. The reason she looks back so fondly on those activities is because she did them with her mother, Nu Ly. Huynh’s mother had learned from her own mother in Vietnam. One of Huynh’s mother’s dreams had been for her daughter to open her own restaurant. Sadly, Huynh’s mother died from lung cancer in 2007. Today, she would be beaming with pride. 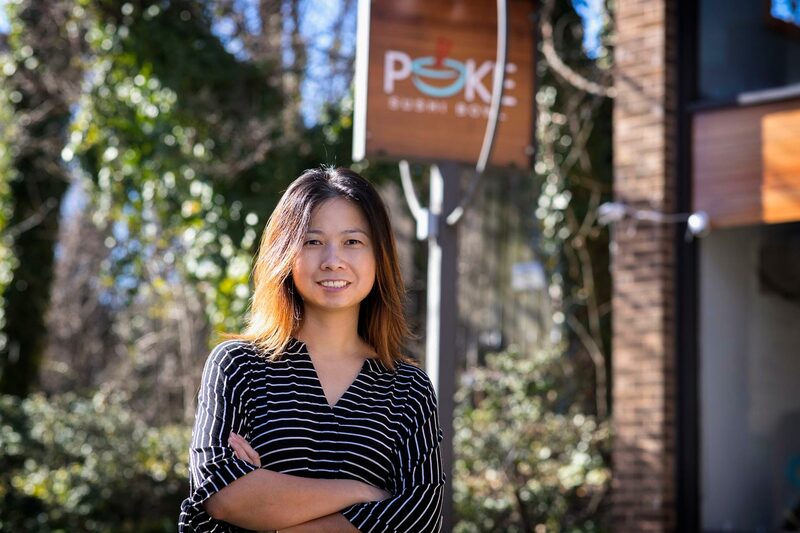 Hyunh, a 2004 alumna of the University of Virginia’s McIntire School of Commerce, and her husband Bo Zhu have owned and operated a number of successful restaurants over the last decade. They include East Garden, a Chinese buffet in the Pantops area; and Got Dumplings, which began as a food truck and now has a bricks-and-mortar location on the Corner. The couple’s latest endeavor is Poke Sushi Bowl, a restaurant offering Hawaiian-inspired cuisine that already has six locations throughout the state, including two in Charlottesville – one on the Corner, and another in the Barracks Road Shopping Center. Huynh’s grandparents on both sides lived in China before the Communist regime led them to immigrate to Vietnam. After the Vietnam War, Huynh’s parents moved the family to the United States, settling briefly in Charlottesville with another family member who had immigrated here, before deciding to move to Santa Barbara, California. There, Huynh’s dad worked odd jobs, while her mother sewed dresses at a textile factory. Huynh said the family lived in a tiny one-room abode, in which they had to rent out a bed to a non-family member in order to make ends meet. During Huynh’s freshman year of high school, the family decided to move back to Charlottesville. The family briefly owned a Vietnamese restaurant called Crystals (the space now occupied by Indian restaurant Milan) before having to sell it when Huynh’s mom was diagnosed with cancer. While an Albemarle High School student, Huynh began working at a Chinese restaurant to save money for college. There, she continued learning about the restaurant business – and met Bo. Subsequently, Huynh earned admission to UVA, becoming the first member of her family to attend college. Taking an economics class during her first year at the University made Huynh realize that she loved working with money and numbers, and she successfully applied to transfer into McIntire. Huynh said she loved the intimate nature of the Commerce School classes. “Having to present, talk in front of class and give PowerPoints – McIntire definitely helped me become more of a ‘people person,’” Huynh said. “It really helped me become more comfortable around people. Eventually, though, Huynh and Zhu – longing for a simpler, less labor-intensive operation – sold the restaurant. In 2011, they came up with the idea for Got Dumplings when Aramark, UVA’s food service provider, was looking for new on-Grounds options for students while the cafeteria in Newcomb Hall underwent renovation. Huynh’s mother was the inspiration for the menu items, which are made from scratch. Huynh said the biggest compliment she can receive is when UVA students tell her that her food reminds them of home. On one occasion, she had just closed down the food truck when a student came up to her and gave her a huge hug. “It’s rewarding to know that students can taste the traditional ingredients we use and compare it to home-cooked meals,” she said. At Poke (pronounced “po-kay” by Hawaiians and “po-key” by most others in the United States), diners – much like they would do at a Chipotle or a Subway – can customize their meal. Diners choose a “base” – rice, greens or noodles. Next, they add a protein – sushi-grade tuna, yellowtail, shrimp, crabmeat or chicken. Then comes the “mix-ins” – which include things like cucumber, edamame, mango, tofu, seaweed and pineapple. Everything is then topped with a selected sauce, as well as a choice of gluten-free ingredients, such as ginger, sesame seeds and avocado. After the first location on 14th Street was successful, Huynh and Zhu opened the larger Barracks Road location – which also features made-from-scratch soups with various noodle options – to accommodate more diners. Interestingly, Huynh’s mother never followed any recipes. She created her dishes based on feel. Nevertheless, Huynh said people who have tried both her and her mom’s cooking say they can’t tell the difference. Aside from cooking, Huynh said her mother had a huge influence on her and her siblings. One of Huynh’s favorite things is making many of the same dishes for her three kids that her mom made for her.